Former British Prime Minister Tony Blair needs to face the consequences of his actions after “opening the gates of hell” in Iraq, says Catholic priest Father Newell in an interview with Vice. Tony Blair has caused evil, suffering and mass murder that still goes on to this day after taking the UK to war in Iraq in 2003 based on deception. For his soul not to be eternally damned to the fires of hell, the former PM must truly repent and come clean before the masses and tell us what really went on between himself and George W. Bush that unleashed the demons of hell on earth. 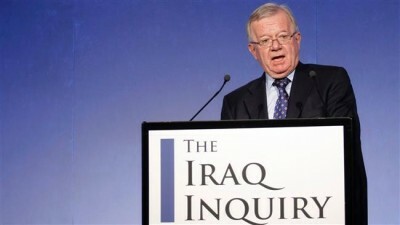 Despite the scathing assessment of the Chilcot Report – an investigation into the Iraq War which was published this week – former Prime Minister Tony Blair is unlikely to face human justice for leading Britain into a conflict that left as many as one million Iraqis dead . The International Criminal Court has admitted it has no power to prosecute him. Even so, for Blair, a devout Catholic, could it be a case of “out of the frying pan and into the unquenchable lake of burning sulphur”? I called up Father Martin Newell, a Catholic priest and peace activist, to find out. VICE: Hello Father Newell. What do you have to do to get sent to hell these days? Father Newell: It’s not as simple as that. Catholic teaching says that hell exists but we’re not sure that there’s anybody in it. People can repent of anything and hopefully they do. God’s mercy is infinite. We all depend on God’s mercy. We’re all sinners. We all do things wrong. There are very serious sins – mortal sins – certainly: murder, for example. We can talk about the invasion of Iraq being mass murder. A sin like that, unrepented, would mean that you are effectively in hell. Obviously lying about something as important as the reasons to go to war, for example, would be a massive offence against truth. How stained is Tony Blair’s soul? It’s not possible to speak about the state of another man’s soul, but it would appear that he has lied to and deceived the public. He seems to be deceiving himself now. He led the country into a war which was completely unjust. In a sense we are all complicit but in this country he has the highest share of that complicity in mass murder that’s still going on. He opened the gates of hell, metaphorically speaking, with the chaos that’s come out of the invasion of Iraq. What he’s done has caused massive evil and suffering. Morally he’s in very serious trouble. Catholic teaching about Hell says that it’s more about the absence of God than something happening. It’s a turning away from God, love, truth, and hope. The three greatest things are faith, hope, and love. The opposite of those is pride, despair, and hatred. That is hell. Wouldn’t Hell be quite fun for Blair? His friends will be there. It’ll be like a retirement home for unspeakable bastards. I don’t think it’s like that… There are a couple of good light-hearted stories about the difference between Heaven and Hell. One is that in both places people are at a banquet, but there are only really long spoons to eat with – too long to feed yourself with. In Heaven people are feeding each other. In Hell people only try to feed themselves but they can’t because the spoons are too long to go from their hands to their mouth. There wouldn’t be any pleasure in being around other people like that at all. Do you think God might be punishing Tony Blair right now? When I look at him I think he looks quite wild-eyed. There was a point a few years ago where he seemed to be coming close to thinking that perhaps he’d made a terrible mistake. And then he went back into this utter certainty that he was right. There’s some kind of madness. It’s possible he couldn’t cope with the realisation that he was coming to and went into total denial about it. He’s dislocated from reality somehow. But when he dies he will have to face that reality. Blair converted to Catholicism. He’s even met the Pope. He is now, it seems, a good Christian. How many Hail Marys do you think he’s had to do to make up for the one million Iraqi people that died as a result of the war? That just doesn’t work, I’m afraid. If you were his Father Confessor, what penance would you suggest? I’ve got a feeling that something like that would have to go to a higher level. As an ordinary priest I wouldn’t be able to absolve something like that. I think it would take a lot of thinking about, a lot of talking. I think he’d have to come out publicly and admit that he was guilty: that he took a country into an unjust war. He’d have to admit everything that it would be necessary for him to admit to be taken to the International Criminal Court or to be prosecuted. It would be about admitting what he’s done wrong and taking the consequences of that. Somebody who is really repentant for a criminal act they’ve done has to go and face the consequences. Really? I always thought confession was a sort of Get Out of Jail Free card for your soul. If it’s something as serious as this, to be really sorry, you can’t just say you’re sorry and then hide it. That’s not genuine repentance, or sorrow, or remorse. As a priest your job is to harvest souls for God. But does part of you secretly you want Blair to go to Hell? No. Not at all. I want him to repent and admit what he’s done: the terrible, horrific consequences of his part in that war. I want him to campaign for peace in the future, to campaign for other governments not to make the same mistakes as him, and tell us what really happened between him and George Bush and all the rest of them, to help the rest of us build a peaceful world. I really want him to change because he could have a massive impact for peace in the world.